My Monster has been incredibly reliable. The carbed engine has been bulletproof over the last 7,000 miles (on the cusp of 20K total), and I haven’t had any issues that have given Ducati questionable reputations in the past. The computer system on my ST3 could be another matter. I rode to work on Friday morning, and was a little over-eager to hit the road. There was either gravel in the street, or I’m not used to the kickstand yet; and I dumped the new bike in slow-motion like a stupid rookie. I managed to pull the bike up almost immediately, and sheepishly rode to work. There was virtually no body damage, but when I turned the bike on, the EOBD (check engine) light was on, the coolant temperature wouldn’t register, and the fan wouldn't shut off. I scoured some Ducati.ms forums, and came to the conclusion that I had damaged the coolant sensor, and that I could probably ride down to Pennsylvania to see my brother later that day, as this was my plan for the afternoon all week. After work, at the entrance gate to the Holland Tunnel, the engine started sputtering, and the engine wouldn’t engage when heavily twisting the throttle. I couldn’t turn around in merging traffic, so I decided to limp over to Jersey City, and then in an anxious fit of reckless bravery/idiocy, to see how far I could go before having the issue again. After I got on the Pulaski Skyway, the bike felt fine for two hours, and I was hoping cleaning or drying the sensor would resolve the issue. 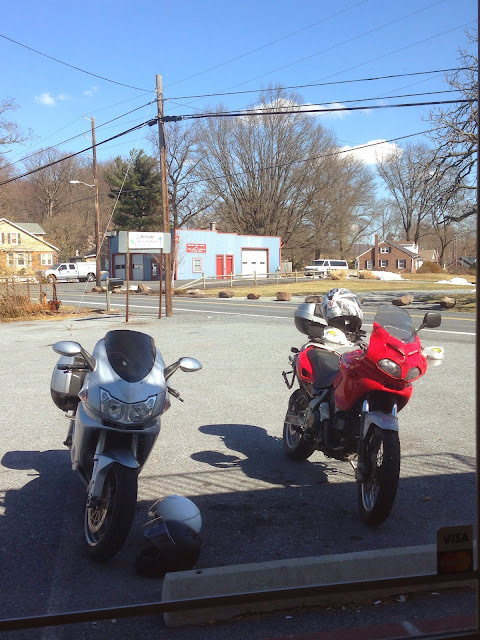 I need electrics...Saturday was beautiful day; sunny with temperatures in the high 50's in PA, perfect for a late winter ride. 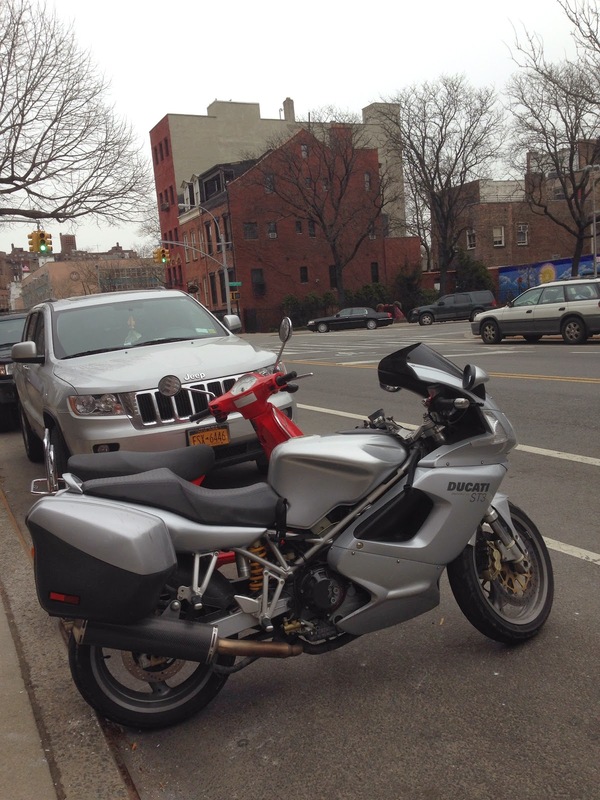 Sunday was cloudy, cold and barely in the 40's, creating a pretty brutal atmosphere for bringing my bike back to NYC. I love my new saddle and tank bags, and a windscreen is an entirely a new experience for me, (since my Ducati Monster affords none of those accoutrements) but neither handwarmers nor wind protection afforded me too much comfort on the long, cold ride back to the city. After a rather lengthy trip back to Pennsylvania last week by bus, my girlfriend and I met up with my brother in-law and went riding out from Giegertown out to Adamstown, PA. He's the Ducati expert in the family, and rides a Cagiva Gran Canyon, and I I took the ST3 out for the first time recreationally.